Architecture today is not just a discipline of combined design and engineering, rather, it has become an expression of beauty, art and modernisation as different artists showcase their borderless ideas transgressing into the future. Form and style became totally different with early concepts of houses, commercial complexes, hotels, and art spaces. Now, architecture is concerned not only with the sophistication of technology used or the intricacy of designs, but it is also aware of the need to preserve the environment as the human civilization continues to progress. Architecture, as a discipline, is a means to define and redefine the kind of civilization in the past, present, and in the future. It has also become an advocate of preserving life and advancement. Vincent Callebaut’s Dragonfly Vertical Farm is potentially the new hope to address the need of environmental and ecological sustainability. This 132-storey redefined skyscraper intends to house plants and animals not in a horizontal manner, but rather, in vertical stand. The Belgian architect used the dragonfly exoskeleton as an inspiration to properly utilise wind, solar, and water energies in the hope to lessen food shortage problem too. The metal and glass structure allows the accumulation of warm air for heat purposes during the winter and serves as ventilation to let the cool air pass through during summer. It is expected that the experimental architectural design will take place in Dubai but Callebaut anticipates it to occur in the heart of New York to keep up with the growing crowd in Manhattan. A fresh perspective of living in urban is possible with Kann Finch’s The Origami. It is a reinvention of the usual structure and style of residential tower which is linear and vertical in form. Through the collaboration of Finch and the project’s architect, interior designer, and engineers, The Origami intends to surpass the constraints of ordinary apartments and condominiums by providing extensive space for the tenants. Located in Dubai, the 46,000 square meters architectural piece is a rich expression of three dimensional image and uniqueness by patterning the building into an “H” style. Its base is a podium for green landscapes as well as space for roof gardens. Each unit’s spacious balconies make the indoor and outdoor experience a delightful one without sacrificing privacy. United Nation’s organisational nature, culture, and function could be best represented by the United States Memorial Space. The third place winner of the competition held in South Korea on 2009, ACME, a London-based architectural firm, showcased UN’s identity by a building made up of cell-like structures. Each cell is in hexagonal shape which signifies that UN is composed of different countries bonded by a single purpose. The memorial complex is designed to use normal daylight which explains its purpose for having a green roof. This hive-like space has a 1,500-seater assembly hall, a theatre, an exhibition space, office rooms, as well as multi-function educational rooms and public viewing halls. ACME enticed the public by presenting an open staircase leading to the green roof. Sergey Skachov’s The Great Bayan is inspired by the maker’s hobby of creating fantasy world. With his current profession as an environment concept artist, this piece which is set in the oasis of Kazakhstan intends to provide habitat for people. Skachov’s inspiration is his passion for traveling and his experience in a place named Bayan-Aul. The Dystopian Farm is probably the hope for the pressing need of food shortage in the next four decades. Eric Vergne thought that since urban living will be dominant in the near future and that food will be a major problem, building a skyscraper that can house human, plants, and animals can possibly be a solution. 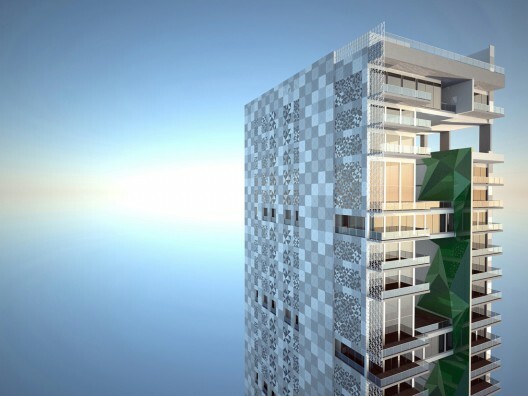 This third place entry in the Evolo’s 2009 Skyscraper Competition is modelled after a fern, the plant which is able to survive for more than 400 million years on Earth. The structure is made up of several layers housing large farms, small farms, housing, markets, and local circulation or the residential areas. The idea of its biomorphic form is to mimic the actual process of producing food in plants where it has to start from its base to the tip of its leaves. First place in the ArtSpace Competition in 2008 is Complex at the Centre of the Universe. Staszek Marek’s design dreams of a huge architectural piece at the centre of an oceanic body where technology, man, and natural species can thrive altogether. The design is intricate which is being rendered through 3D graphics. Marek is not an architecture master but he is able to combine 3D image and architectural design to produce a promising piece in the future. The Dead Sea, aside from its inadequacy to sustain life, is a source of political friction among the countries in its region. 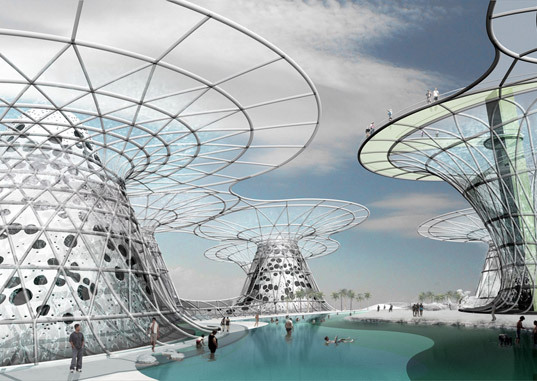 The New York-based architectural firm Phu Hoang Office innovate No Man’s Land, a possible relief for the Dead Sea. This shortlisted project in the Architectural Association’s Environmental Tectonics 2007 dreams of building a complex on the Dead Sea that is capable of producing fresh water and will serve as a tourist attraction. The process is complicated since there has to be a building that will enable desalination process which filters water molecules in the air and turn it into a source that has the ability to provide life. No Man’s Land is seen to resolve political, environmental, and humanitarian problems in the region buy producing fresh water. A tropic city like Dubai can definitely use a multi-function architectural piece that will turn sun rays into something more usable. 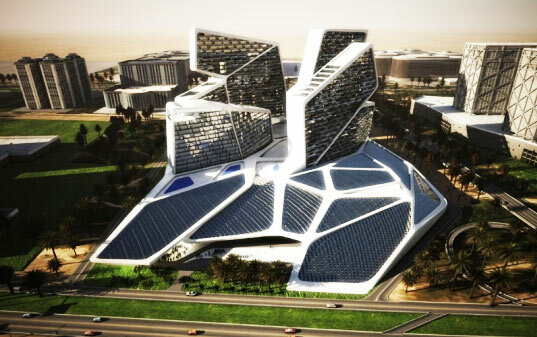 Graft’s Lab’s Vertical Village is a holistic idea to convert heat coming from the sun into solar energy. The building is made up of numerous solar panels that will capture heat. The angle position and the design of the structure help in minimising solar gain while increasing solar production. This is seen through the roof which is in a leaf form made to break up solar rays into smaller and more manageable portions. Residents can have the most out of their stay in theatres, cinemas, restaurants, or shops with Vertical Village’s energy-harvesting features. Jacque Fresco, a Florida-based artist, dreams of having a sustainable global human civilization wherein human rights are not only stated in laws, rather it is already a way of life. The Venus Project ambition is to have an ideal way of life by portraying futuristic skyscrapers, flying vehicles, streamlined houses, and cybernetic cities. This circular-shaped city is embodied with the idea of building sophisticated technology in order to break people’s tiresome tasks and instead, spend time on leisure. Fresco termed his project as the “thinking city” which is based on the macro concept of “Cities that Think”. Within this city are Cybernated Government, University of Global Resource Management, Subterranean Cities, and Intelligent Housing, each with elaborate design. The Venus Project aspire to have a new “world” society by transpiring imaginative and energy-efficient future. Songjiang Hotel offers a whole new hotel experience for residents of Songjiang and for tourists of China. This five-star hotel is located in a water-filled quarry with natural water and landscaped features. The Atkins architects captured the attention of the public by combining world-class facilities into an environment-enclosed area. This commercial building was built with respect to the surrounding natural living species amidst having 100-meter deep public areas and guestrooms. It also houses 400 bedrooms, restaurants, sports facilities, assembly hall that can be occupied by 1000 people, as well as a banqueting centre and cafes. The architects wanted it to be visually and functionally appealing to the public. Set in the Derwent Water in United Kingdom, Mega Village 2108 is one of the breakthroughs in architectural design with the idea of ability to hold humungous population without destroying the environment and further enhancing the ambience of a naturally good-looking scene. 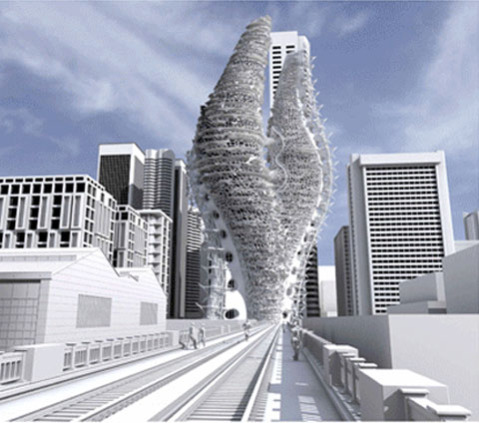 This proposal by Andrew Barton placed third among the entries for the ArtSpace Competition in 2008. Barton made use of carbon nano tubes to be able to build a formidable design which according to him, is currently out of the possibilities. His overall plan is to build a human sanctuary that is calm and dramatic at the same time. The judges were impressed due to Barton’s ability to combine architecture and landscape in one piece which paved the way to recreate architectural designs in the future. 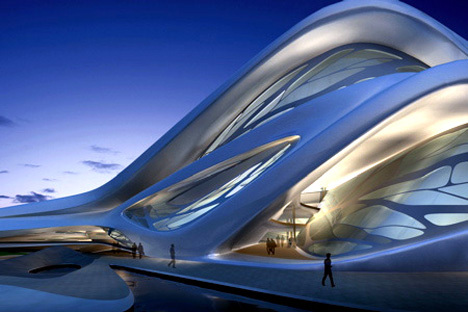 The Zaha Hadid Architects presented an innovation of the Abu Dhabi Performing Arts Centre which is one of the projects of the Tourism Development and Investment Company of Abu Dhabi. This 62-metre high architectural piece is proposed to house five theatres including a music hall, a concert hall, an opera house, a drama theatre, and possibly an Academy of Performing Arts and can hold an overall seating capacity of 6,300 people. The architects describe its complex form and design as a “sculptural form that emerges from linear intersection of pedestrian paths.” The Performing Arts Centre is a continuing project between the Guggenheim Foundation and the government of Abu Dhabi.